LAS VEGAS – Jan. 1, 2018 – Shelby American and Shelby Legendary Cars will offer a limited number of Shelby Cobra Daytona Coupes and FIA roadsters honoring world champion driver Bob Bondurant. The continuation series will be introduced at the Barrett-Jackson Auction in Scottsdale, Arizona, from Jan. 12-21, 2018. Based on Cobras raced by Bob Bondurant, only 50 total cars will be built and each will bear a CSX2000 Shelby serial number. Owners of the new Shelby Cobra roadsters and Daytona’s will also receive driver training at the Bondurant Racing School. Carroll Shelby planned to race the Cobra from the beginning. Powered by a small block Ford engine, the cars dominated sports car racing from 1963-1966. The competition model versions were piloted by legends including Dan Gurney, Phil Hill, Dave MacDonald, Ken Miles, Allen Grant and of course, Bob Bondurant. In 1963, Bondurant joined Carroll Shelby’s racing team for the final three races of the season. He won all of them in a 289 Cobra roadster including the LA Times Grand Prix pre-race; he could not qualify in time for the grid, so he started last and still came in 8th overall against the prototypes. Bob then went to Europe in 1964 to win the GT class at Le Mans with teammate Dan Gurney in a Shelby Cobra Daytona Coupe. He drove both Shelby Cobra roadsters and Daytona Coupes during 1965, winning seven out of ten total FIA World Championship races. His incredible feat secured the FIA GT Championship title for Ford and Shelby. The Bondurant edition Shelby FIA Cobras roadsters and Daytona Coupes will bear a CSX2000 series serial number and will be supplied as a turn key car, minus the engine and transmission. The FIA Shelby Cobra continuation roadster is based on CSX2345, which competed in seven FIA events, more than any other convertible. CSX2345 had five first-place wins and is the only Cobra to compete in both the 1964 and 1965 racing seasons in Europe; it was also the only roadster on the team in 1965. The Bondurant edition Shelby Cobra Daytona Coupes are historically-accurate continuations with leaf spring suspensions, tube frames, and thin wooden-rimmed steering wheels. They also feature modernized disc brakes, aluminum bodies, updated and strengthened frames and a racing interior. The Bondurant edition Shelby 289 FIA Cobra roadster in fiberglass will start at US$149,995.00 and the aluminum version will begin at $249,995. A roadster set up to HTTP FIA specifications and for track use only starts at $289,995. The aluminum Shelby Cobra Daytona Coupe will start at $394,995. Each will be built to order and delivered with a Shelby American serial number for documentation in the Shelby American Worldwide Registry. Orders are now being accepted. For more information, visit www.shelby.com, www.Shelbylegendarycars.com or www.HillbankUSA.com. Those who purchase one of these continuation cars will enjoy a day of training at the Bondurant Racing School in Arizona. Over 500,000 students have learned from Bondurant’s expertise since it opened on February 14, 1968. Founded by legend Carroll Shelby, Shelby American manufactures and markets performance vehicles and related products. The company builds authentic continuation Cobras, including the 427 S/C, 289 FIA, 289 street car and Daytona Coupe component vehicles; it offers the Shelby GT, 1000, Super Snake and Shelby Terlingua Racing Team post-title packages for the 2005-2017 Ford Mustang. Shelby American also builds the Shelby Raptor and Shelby F-150 muscle trucks. For more information, visit www.shelby.com. 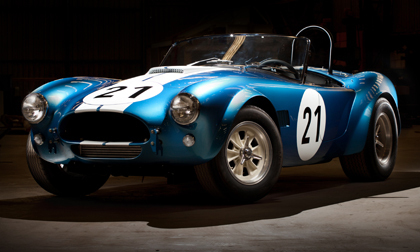 Legendary Shelby Cars continues the heritage of Shelby American’s world famous 1960’s Cobras, Coupes and GT40’s. The company is keeping the Shelby flame alive with licensed vehicles that include a documented Shelby serial number, just as though production never ended. The current vehicle lineup includes the nimble small block Shelby Cobra roadster in both street and racing (FIA) configurations, the mighty big block Cobra roadster, the world champion Shelby Cobra Daytona Coupe and the Le Man-winning Ford GT40. Each one honors the 1960s era cars with authentic chassis, bodies and powertrain options. Additional information is available at www.shelbylegendarycars.com or www.Superformance.com or by calling (800) 297-6253.